The hotel is opened on October 4, 2018. The Asakusa area—home to Hotel Gracery Asakusa—offers convenient access to and from Narita and Haneda airports, and features several of Tokyo’s well-known sightseeing destinations for foreign travelers, including the Senso-ji temple and Kaminarimon Gate. The hotel itself is located about 1 to 2 minutes on foot from Kaminarimon Gate and about 3 minutes on foot from Asakusa Station on the Toei Asakusa Line, and has become one of the most sought-after base locations for sightseeing and leisure for both Japanese and international travelers. 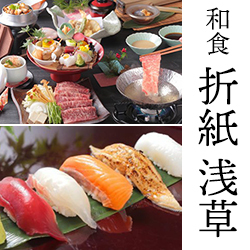 Everyone including Muslims can enjoy our authentic Japanese cuisine. RESERVATION IS AVAILABLE at Concierge desk of Hotel Gracery Asakusa! ↑You can see the website of the travel guide by Taito ward! Guest rooms offer both heating and air-conditioning facilities. Each room is equipped with a fridge, an electric kettle, and a flat-screen TV.